Rollators and walkers are designed to help people with mobility or balance issues get around safely. The main difference between the two is that walkers do not have seats or breaks, whereas a rollator has both. In this blog, we will learn about rollators. A rollator is a walker with 4 wheels, seat and basket. Rollators are simply pushed like a cart rather than having to be lifted. Perfect for outdoors, rollators are excellent for long trips or for those that do not want to be slowed down by mobility equipment. There are even some narrow enough to navigate through constricted halls and doorways. Rollators can be used for a variety of reasons, but the most common is that people are looking for a mobility aid that will give them more support than a cane. People should consider a rollator when they want to remain active, need to sit often, can’t lift a walker, and need more mobility assistance. 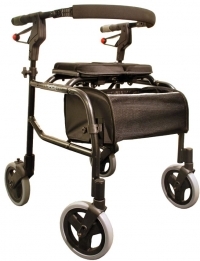 · Large wheels allow the user to easily push the rollator over uneven ground. · Large padded seats are comfortable for resting. · Collapsible Pouches are ideal as it can be folded with the rollator instead of removing it. · Easily foldable rollators allow you to transport the rollator in vehicles, it is important that it can collapsed for transport or also have the ability to fold it in restaurants to avoid blocking the walkway. Rollators like the Nexus III, or the Evolution Technologies Xpresso Lite Rollator, for example, have been popular due to their sturdiness, comfort, manoeuverability, and price. They are ideal for anyone wanting to stay active, and then needing to take a break. For those with mild to moderate issues with balance, strength, or endurance issues, rollators may be subsidized through the Assistive Devices Program. A rollator greatly enhances the user’s independence, self-esteem, and quality of life. Balancing exercise and a social life will help users including seniors improve blood circulation and general health. Feel free to call us toll free at (800) 379-4780. Our highly-trained staff is always happy to answer your questions.